In retrospect, maybe going back to my home country, Trinidad, for a whole month was not such a good idea. After all, even though I love the experience of living overseas, especially in Asia, there is truly no place like home. I am Trini to the bone always will be, and after spending a month there, it was incredibly hard to leave!! But what a busy month! One huge wedding, one Christmas Day, one Ole Years Night and one New Years Day, two hikes to a waterfall, many trips to Maracas Beach, one trip to the Bat Caves of Tamana, one night of the sweet sound of steel pan with the Silver Stars, countless doubles, far too many rum-and-waters, and one baby baptism. All in all a good month. Here are some of the highlights…. This was Seiji’s first time in Trinidad. I think he had a good time. He certainly enjoyed the food! That man could real eat! And he had a great time bobbing in the green Caribbean sea. 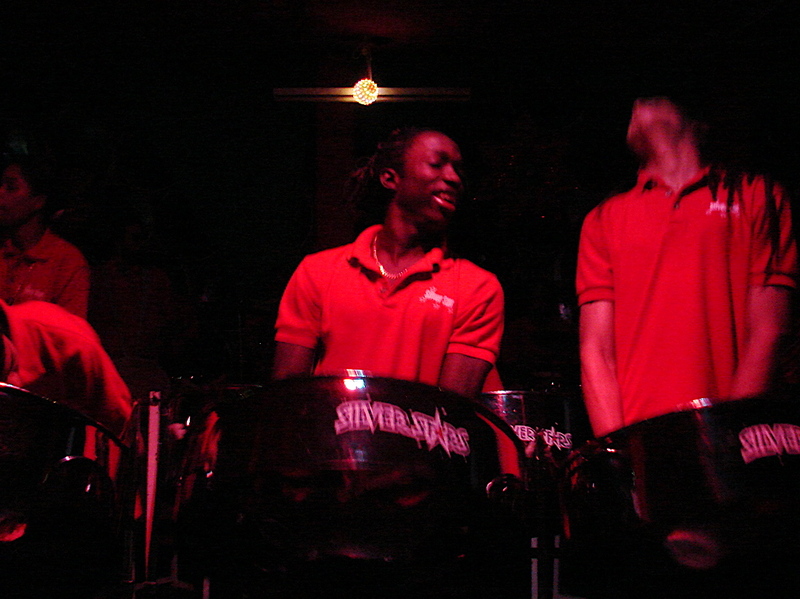 We went one night to the Silver Stars Pan Yard on Tragarete Road, and were simply blown away by the music. Talk about sweet sweet pan, boy. Many of the pannists were young, and one guy looked like he was barely 14! But they were absolutely incredible. They also did all kinds of things I’ve never seen before in pan — playing each other’s pans with their eyes closed, playing the pans upside down, and for the grand finale the ENTIRE band rotated and played each other’s pans without missing a single beat! They are truly taking pan to the next level. I also truly enjoyed spending time with the two little monkeys in my family, Alex and Amy, and was very honoured to become Amy’s godmother. We took the kids up to Avocat Waterfall (a.k.a “Pop’s Waterfall” because you park your car by this 86-year-old Indian man named Pops who lives nearby) and had a river baptism. Much better than going in a church, in my opinion! Oops. That probably will offend some people. My good friend Lisa, who I lived with for many years while I went to university in Toronto, came down for a visit. We also did some great sightseeing — in the picture above we are at the mouth of one of the Bat Caves of Tamana. 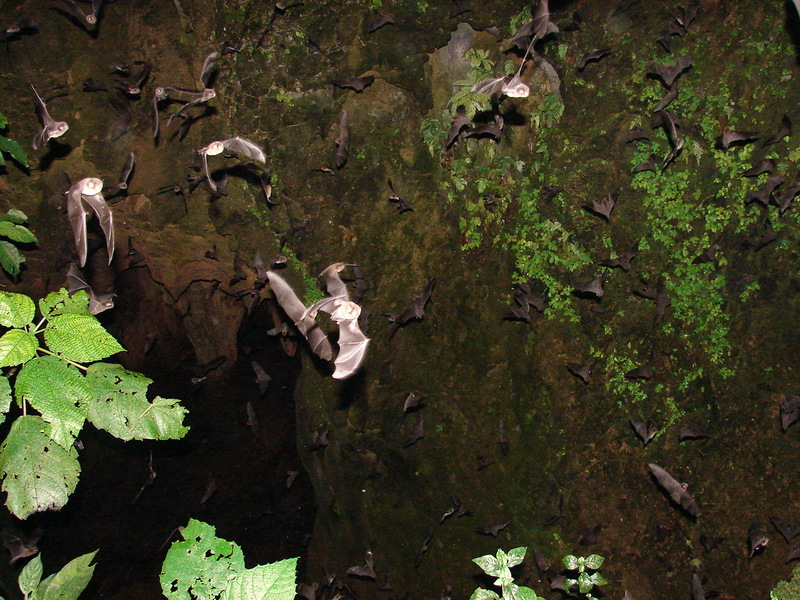 Every evening, hundreds of thousands of bats start streaming out of the mouth of the cave to go into the forest to eat fruit. Why would anyone want to get so up close and personal with a bat colony? I guess some people have a funny notion of ‘fun’! Now imagine that this picture was taken in a fraction of a second, and look at how many bats there are. We watched the bats for about 45 minutes — how many bats do you think could be living in there? Millions? Amazing! 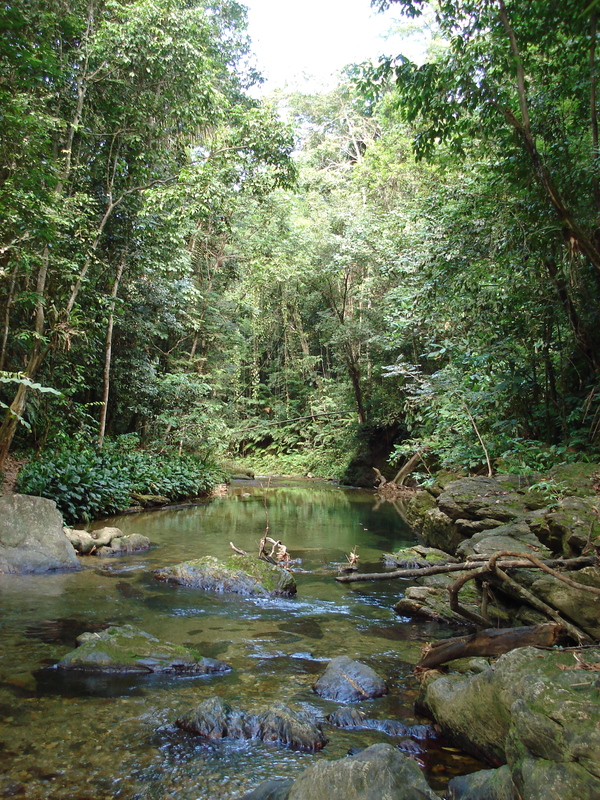 Anyway, if you want to go to the caves to see this amazing sight for yourself, contact Stephen Broadbridge of Caribbean Discovery Tours, who is an amazing eco-guide and has a trusty Land Rover to take tourists deeeeeep into the jungles of Trinidad. I would highly recommend going, if you have the time.